Artist of the Masterclass – Charita Lingam , a multi-talented and adventurous crafter who is an expert in several crafting techniques! Join her workshop to enjoy wonderful practical learning exposure as you build a gorgeous 3D texture on a regular paint brush. 3. Paper Decoupage and Stamping on a round MDF coaster with a vintage crackled effect. 4. Tricks and tips of other essential crafting methods like layering, composition, balance, cutting techniques, distressing, dabbing, stamping, sanding, spraying, varnishing and much more. 5. Use with glues & mediums, acrylic paints, Little Birdie’s Two Step Crackle Medium, chalk paints, decoupage tissues and paper, rubber stamps, inks and more. 1. 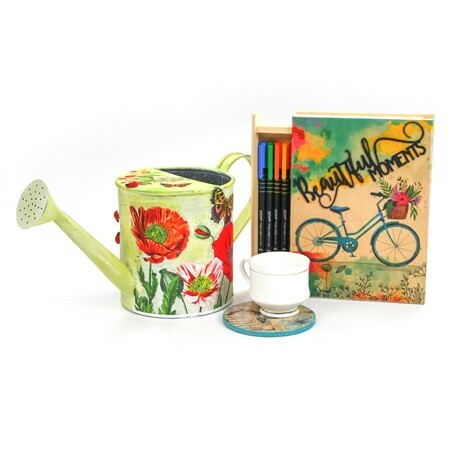 3 completed decoupage projects on a huge metal watering can, round MDF coaster and medium size wooden book box.